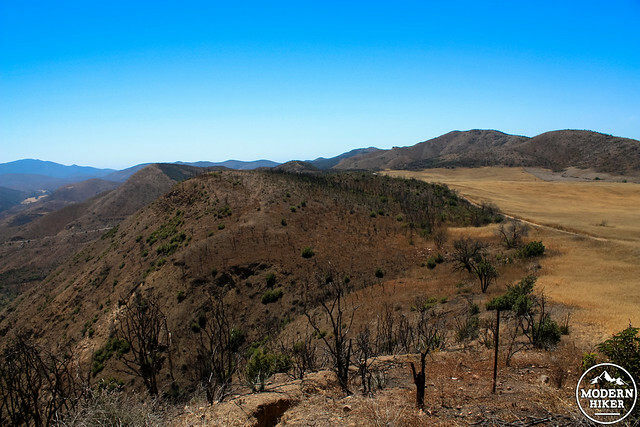 On May 2, 2013, the Springs Fire erupted near the 101 and made its way through the hills near Thousand Oaks and into Point Mugu State Park and Rancho Sierra Vista / Satwiwa. By the time the fire was extinguished, it had burned 24,238 acres of land and 12% of the total land of the Santa Monica Mountains National Recreation Area, making it the 5th largest fire in the area’s history. Luckily for outdoors lovers, the region’s park authorities were able to open the park back up to visitors again just a few weeks afterward, providing not only an invaluable opportunity to teach lessons about fire ecology to the public, but also to encourage continued use of the trail system so that trails didn’t become so overgrown or washed out that they’d have to be totally rebuilt (for contrast, the Angeles National Forest still has sections of the San Gabriels closed from the 2009 Station Fire in 2015 – and areas that were reopened years after the fire are often impassable for hikers). 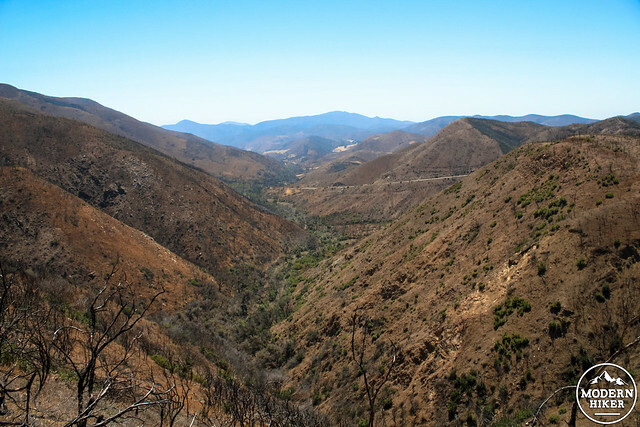 I visited the region right after the parks re-opened and wrote about the experience of hiking through Big Sycamore Canyon, which at that time looked like the bottom of a fire pit. Park Rangers set up a unique and groundbreaking citizen science project to document the region’s recovery and built an online map of ten different locations in the park where visitors are encouraged to take photos. On the map, you can scroll through a timeline to see how each of the views has changed since the fire. 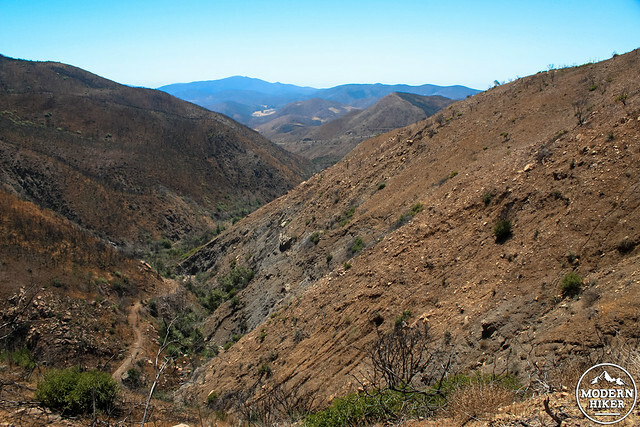 On a return visit in 2015, I found that the region still has a ways to go, but there is a vast difference between Upper Sycamore Canyon in 2013 and the same canyon in 2015. This trail begins from the lower parking lot just off the official park entrance from Potrero Road. Use the restrooms or fill up on water, then begin along the wide dirt path that passes some of the old ranch buildings on its way into the park. 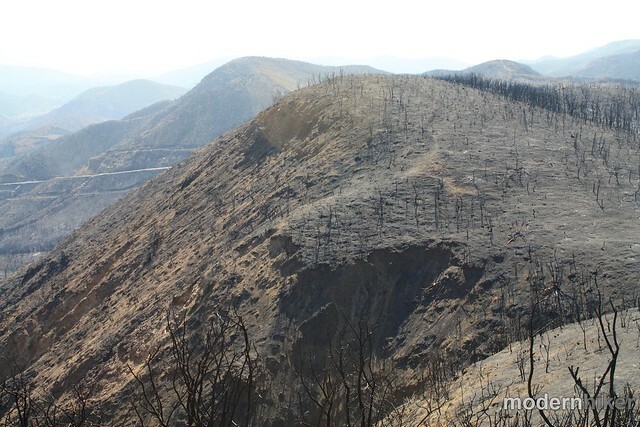 Even here, the effects of the fire are apparent – one side of the road is heavily singed while the opposite side remained mostly untouched. 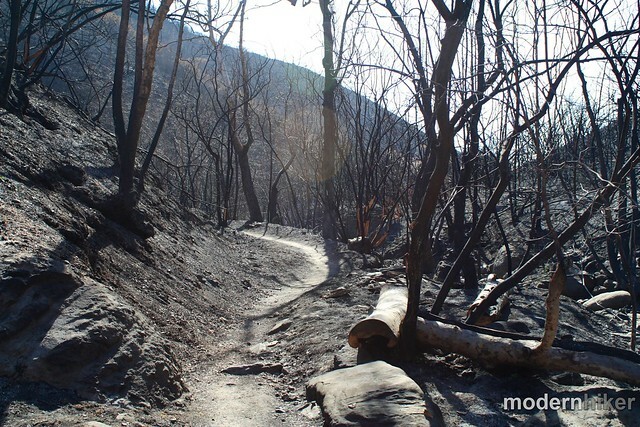 Along this path, you’ll pass the first of the Springs Fire photo stations. If you feel so inclined, snap a shot here and add the appropriate tag on social media (or you can just email your photo to the park, too). In this area, the Park Service is using the Springs Fire as an opportunity to restore some of the native, pre-ranch habitat. They’re adding plants from the cholla scrub, coastal sage scrub, and native grassland communities in the hopes of providing additional habitat for native species like cactus wrens and grasshopper sparrows. By 0.4 miles, you’ll pass the Satwiwa Native American Cultural Center (open on weekends from 9AM to 5PM). 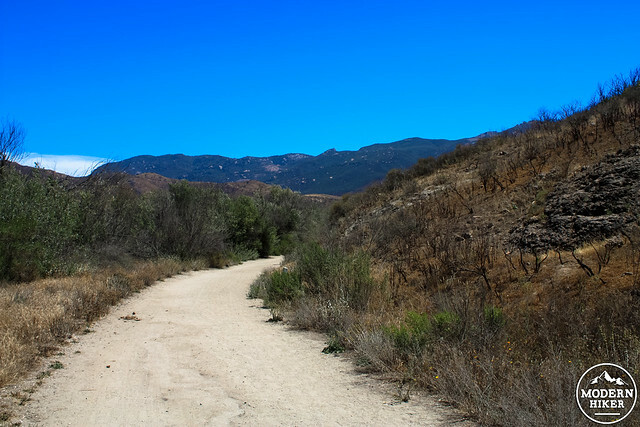 Cross the paved Big Sycamore Canyon Road and begin hiking on the Satwiwa Loop Trail, counterclockwise. 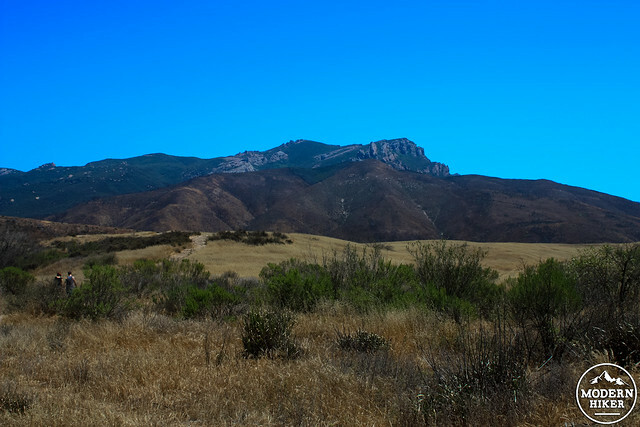 This trail cuts across a large meadow in front of some of the best views of Boney Mountain in the entire Santa Monica Mountains National Recreation Area. From this vantage point, you can also clearly make out the extent of the Springs Fire’s burn. 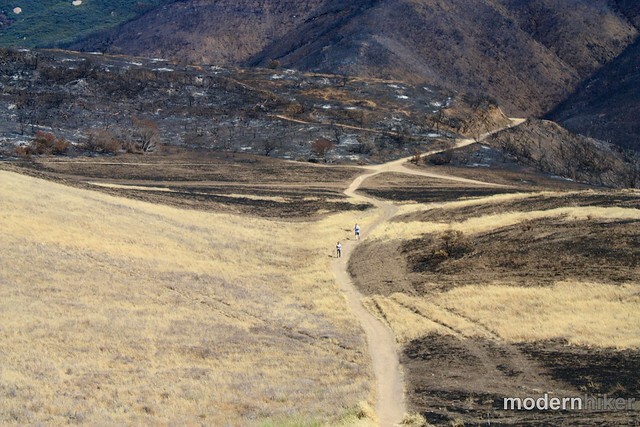 At 0.75 miles, the trail comes to the northern edge of Upper Big Sycamore Canyon, where you can really get a sense of just how much this region has recovered since the fire. From this junction, head into Point Mugu State Park on the Danielson Road (from this point on, no dogs or bikes are allowed). 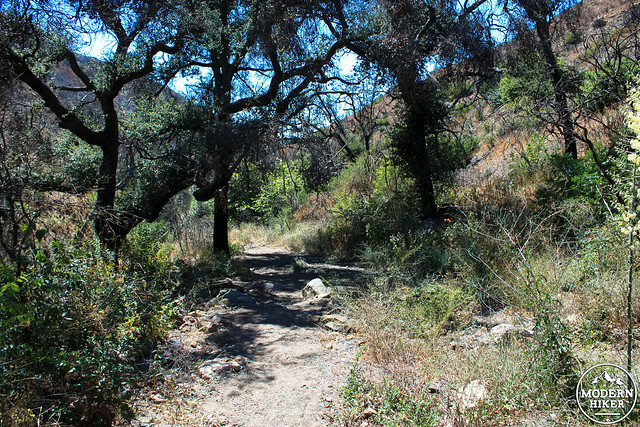 Stay to the right at 0.9 miles to start your descent to the floor of Big Sycamore Canyon. 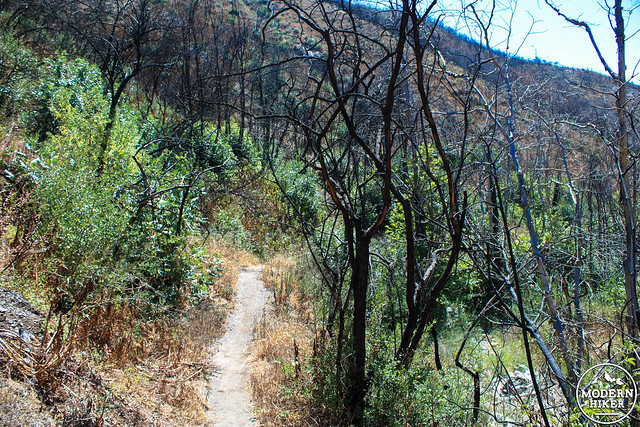 Be on the lookout for badly eroded sections of trail near the canyon’s edge, and be sure to look down into Big Sycamore Canyon to see the hopeful patches of green along the the canyon’s itinerant stream. 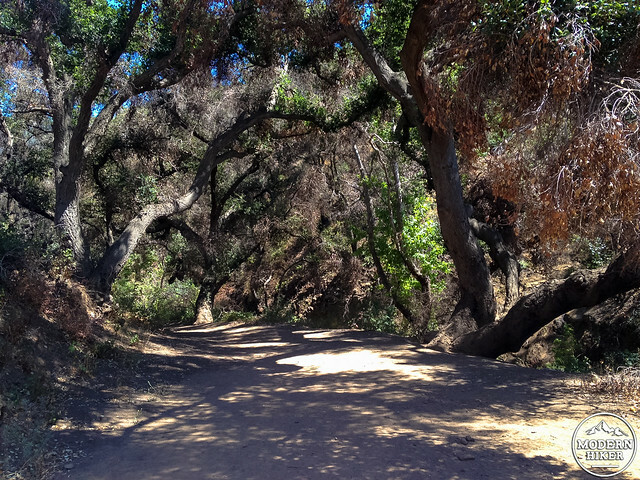 At 1.3 miles, take a hard right onto the Upper Sycamore Trail (staying straight will take you on a much longer loop through the park, where you can visit ranch ruins and a seasonal waterfall). Although the trail signs have been melted here and many of the hillsides remain charred, a surprising amount of green now exists in the upper reaches of this canyon. Now, even after two years of continued drought, there is life all over the canyon. 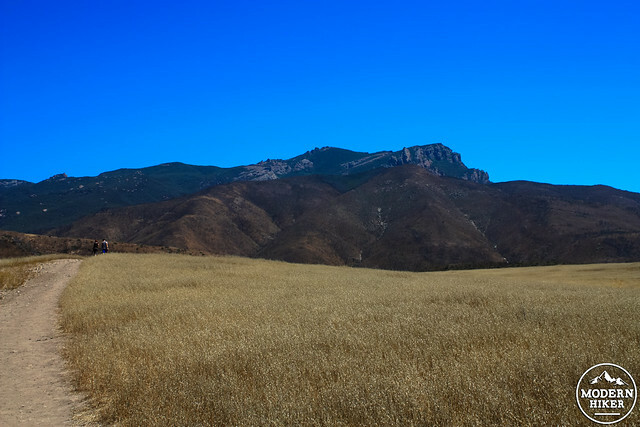 The chaparral, sage scrub, and riparian plant communities that live here have evolved to survive and even thrive with the region’s regular wildfires. 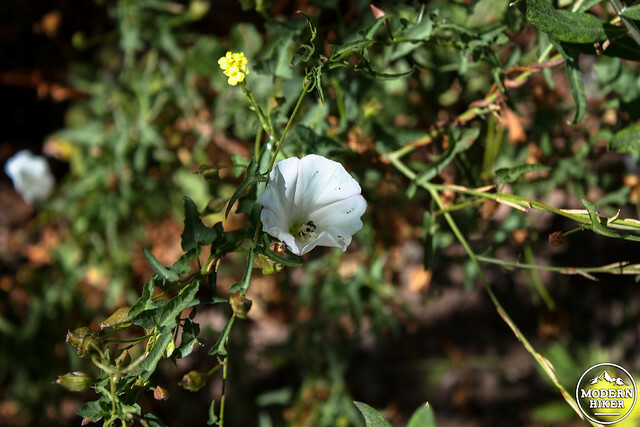 Many of the plants’ roots remain alive even after everything above ground has been burned – and some seeds can only germinate with the high temperatures a wildfire brings. 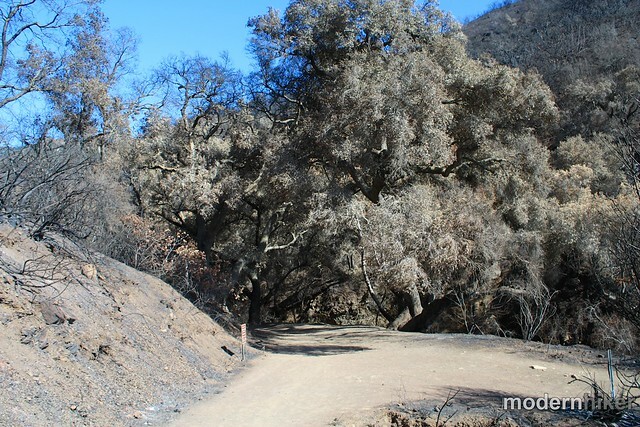 Many of the sycamores and oaks in the canyon were sprouting new growth even as their crowns has been completely burned off. 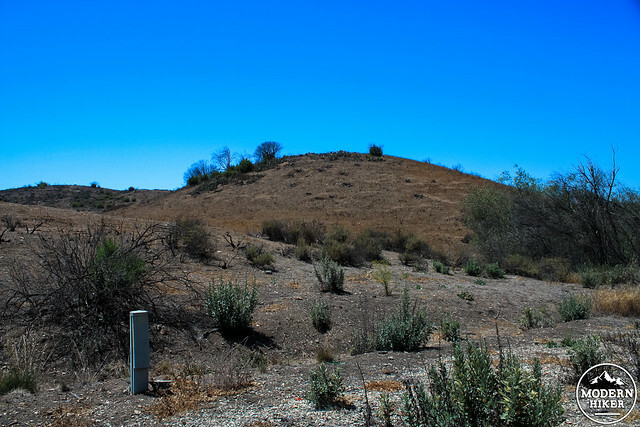 Dr. Marti Witter, the Fire Ecologist for the Santa Monica Mountains NRA explained to me that in some cases the drought had even helped re-establish some natives in areas that had been overrun by invasive species. In 2014, she explained, the area had only one major rainstorm and it was in February – late in the rainy season. That late rain favored later-germinating native grasses and not the earlier-germinating mustards and non-native grasses. She said that even with low precipitation in both 2014 and 2015, there was still enough to foster a good diversity of herbs and perennials and excellent conditions for bulbs, although because 2015’s rain came earlier most of the plants had dried up much earlier than usual. The bigger concern in the area right now is a “higher than usual mortality” in plants that re-sprout from underground burls or germinate from fired seeds. 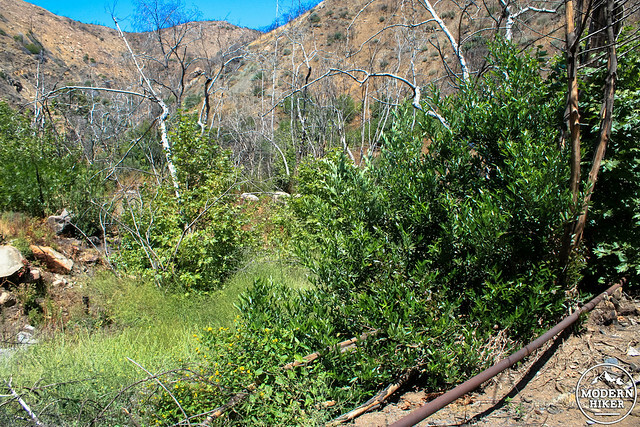 Dr. Witter also mentioned that many plants that did not burn were dying from drought stress and that large patches of bigpod ceanothus died in the year after the fire – and almost none of their fire-cued seeds have managed to establish a new plant. Data is still being analyzed from 2015 so there isn’t much to say in way of overall trends, but these areas could provide a beachhead for more invasive species, which in turn could lower the overall productivity of the ecosystem. Knowing all of that makes seeing the survivor plants even more special as you walk along the bank of the seasonal stream here in Upper Big Sycamore Canyon. At 2.6 miles, stay right at the junction with the Fossil Trail, and at 2.7, turn right onto the paved Big Sycamore Canyon Road. It’s a long, shadeless slog back to the trailhead from here – and it’s all uphill. So be sure to bring lots of water and sunscreen – or get started nice and early or late in the day to avoid the worst of the heat. 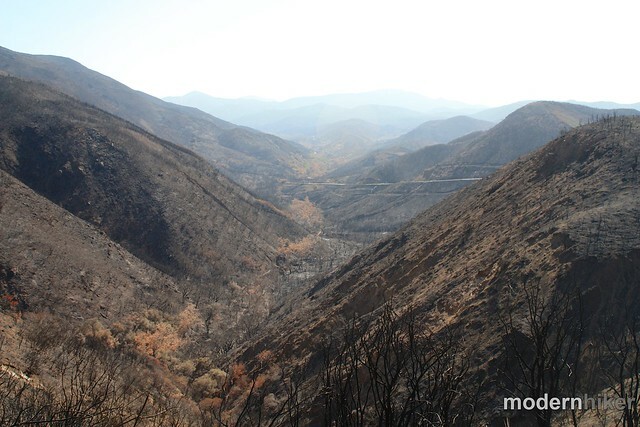 And be sure to come back to revisit this trail as the years go by to watch this fire recovery in real time. For more information on the Springs Fire, visit the NPS Springs Fire Recovery Plan page. Special thanks to Dr. Marti Witter for clarifying the fire recovery process and providing invaluable insight into this region. 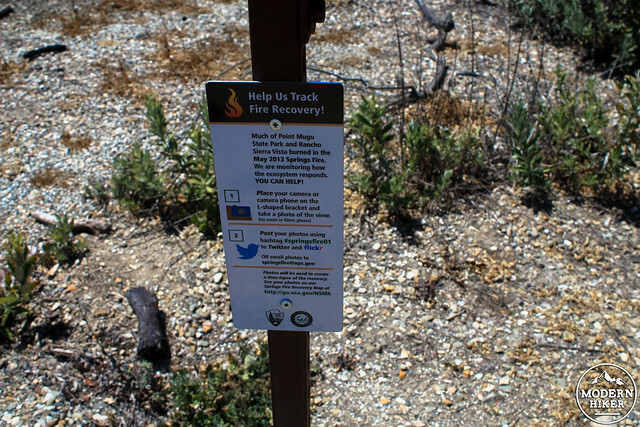 The trails themselves are in decent condition following the Springs Fire and are generally improving as both the human and natural restoration continue. 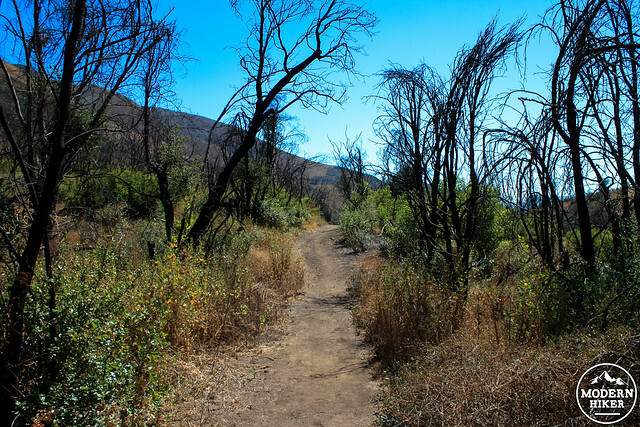 There are many heavily-eroded areas and some or all of this trail may be closed following heavy rain until the chaparral returns and helps hold some of those canyons in place. There is camping in Point Mugu State Park, but it's on the southern end of the park near the coast. From the 101, take the Lynn Road exit in Thousand Oaks and head south. Continue for 5.6 miles. Just past Via Las Brisas, look for the large gate for Rancho Sierra Vista on your left. The parking area is at the end of the road.